With the holidays just a few weeks away, it is time to start thinking about the meal preparations and what side dishes I will be bringing to the holiday gatherings. Living a sugar-free lifestyle means that my choices can be limited, but with this delicious and simple cinnamon pecan sweet potato side dish, I will have no worries. Bursting with flavor but lacking the sugar filled ingredients, this is one side dish that will be making its way to all our holiday gatherings. This is my first year heading into the holiday season being sugar-free and it feels a bit daunting knowing that there will be tables lined with sugar laden choices. 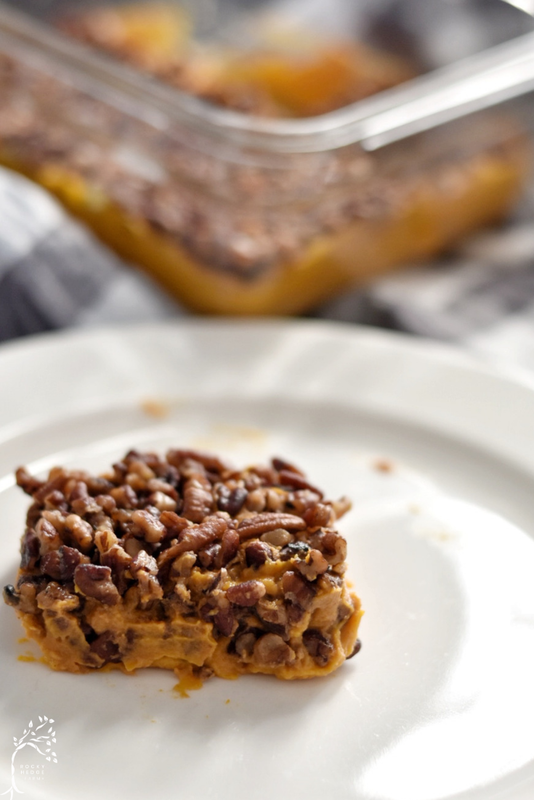 Sweet potato side dishes are always one of my favorite things to eat but most of them are covered in marshmallows or the nut topping is made with a lot of sugar so, this year I created my own version of a cinnamon pecan sweet potato casserole. 1. Preheat oven to 350°F. Toast 1 cup pecans, roughly chopped, on a foil lined cookie sheet for about 10 minutes or until you can smell them toasting. Or, you can follow the directions for my Cast-Iron Skillet Roasted Pecans. Set aside. 2. Scrub the sweet potatoes and place in the oven to bake for about one hour until they are soft, remove from oven and allow to cool. Once potatoes are cool, remove the skins and place the sweet potatoes in a mixing bowl. 3. Add heavy whipping cream, 3 tablespoons xylitol, egg, 1/2 teaspoon of cinnamon, nutmeg and ginger. Beat together well using a mixer. 4. Spoon into an 8x8-inch baking dish; cover with foil. Bake 20 minutes. 5. Meanwhile, in a small pot on the stove, mix together the melted butter, 1 tablespoon xylitol, and 1/2 teaspoon cinnamon. When butter has melted and the xylitol and cinnamon are combined, remove pot from stove and add toasted pecans; stir well, set aside. 6. Remove foil after 20 minute bake time; top with pecan mixture and bake uncovered 10-15 minutes until bubbly and set. Rocky Hedge Farm participates in the Amazon Affiliate program.